This hybrid course, 26 hours of online theory and 4 hours of face-to-face skills validation session, is designed for RN’s and LPN’s looking to gain knowledge or expand their skills in intravenous (IV) therapy. 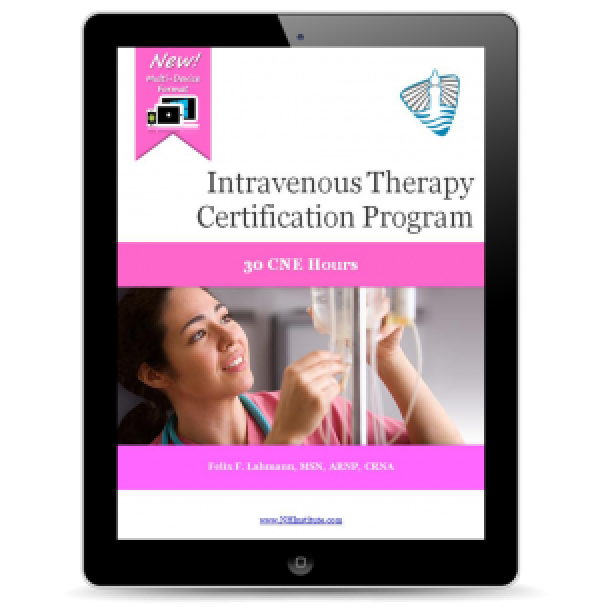 This course prepares participants for initiating and/or maintaining common intravenous therapies. Course topics will include review of vein anatomy and physiology, indications for IV therapy, infection control, nursing management, equipment complications, parenteral therapy including TPN/PPN, blood and blood components. Nursing assessment, documentation and common IV drugs will be discussed. Care of central lines and central line dressings will be covered. This course encompasses minimum competencies for Florida IV certification and the regulations and scope of practice rules. Our IV Certification Program provides students with a skills validation checklist, which can be used by a Registered Nurse (RN), Advanced Registered Nurse Practitioner (ARNP) or Medical Doctor (MD) preceptor selected by the student at their place of employment to complete the student’s skills verification of IV related procedures in coordination with us. The use of the skills validation checklist facilitates the completion of the skills portion of IV Certification Program. The skills validation checklist is found in the "Resources" section of the course once you register and access the course using our online student portal.